"You're just a street kid, you'll never be a Party Secretary!" "Maybe you don't even exist, you don't want this life anymore!" "Communist drug, no seduction needed!" When the Hungarian punk band QSS launched into their anthemic song "Communist Drug" from the 1984 album Kommunista Kabito (or "Communist Stunning"), these explosive lyrics resonated in hearts and eardrums across the country. How do those same musicians feel, 30 years after the fall of communism in Hungary, about the role their music played in their country's history? Fellow musician and contributor to the Hungarian punk record label Makhno Records, Lucile Chaufour is uniquely suited to find out. 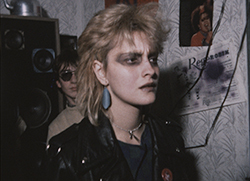 In EAST PUNK MEMORIES she takes viewers into the little-known subculture behind the mohawks. 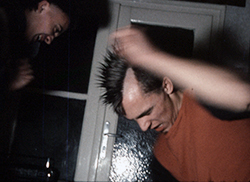 Candid, home movie-esque Super 8mm footage that Chaufour filmed in Hungary during punk's heyday is paired with contemporary interviews of the same musicians today. They bring a generation of experience to this resonant discussion of the position their music and culture has played in their country's political evolution with the passage of time. EAST PUNK MEMORIES includes interviews with musicians Kelemen Balazs, Toth Miklos, Mozsik Imre, Marton Attila, Papp Zoltan Gyorgy, Vanyi Tamas, Rupaszov Tamas, Horvath Attila, Erds Jozsef, Vojtko Dezs, Asztalos Ildiko and Torjek Tunde while their punk bands Aurora, Bandanas, CPG, ETA, Kretens and Modells rock out on the pulsing, thrashing and cannily dissenting soundtrack. The Soviet regime in Estonia went head to head with J.R. Ewing and the heroes of Western television...and lost.